Fishing chairs are exposed to the harsh elements when your boat is not covered. The vinyl on these seats often crack during intense heat, which can make them uncomfortable, and over time, useless. 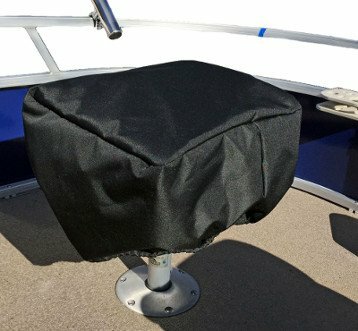 Carver Industries has introduced this simple, one size fits most storage cover for standard fishing seats - no matter what style of boat you have. Each cover is Made in the USA, features a braided rope in the hem, and is available in the Performance Poly-Guard, Sun-DURA and Sunbrella Acrylic materials with a variety of color options. Simply make your selection below. Poly-Guard is made in the USA from durable 100% marine- grade polyester. Extremely water repellent and UV resistant, this material makes an excellent choice for a leaning post cover in just about any environment. Poly-Guard is a breathable fabric, meaning that air is allowed to penetrate the material, discouraging the formation of mild or mildew. The breathability of this material makes it a great choice specifically for areas which experience high humidity and moisture. Poly-Guard weighs 8 oz per yard, so it is lightweight and easy to handle. It offers the highest tear strength of all our materials. This material comes with a 5 year warranty. Sun-DURA® is a 100% marine grade polyester fabric which is made in the USA. This material was specifically developed to provide superior water repellency and UV resistance, and it is a Carver Industries exclusive. Sun-Dura® is our most popular boat cover material, and because it is so water repellent, it makes a great choice for areas which receive a lot of rain. It is also a solution dyed material, which means that its dye is inherent to the cover's fibers, causing it to be exceptionally fade resistant. Sun-DURA® offers a 7 year warranty. Sunbrella is a highly respected, USA made, name brand material made fully from strong acrylic fibers. This material is highly water repellent, but what it is really known for is its ability to provide an almost 100% UV "block", offering you the best intense sun protection available. Sunbrella is a breathable material, so any moisture or heat underneath the cover will be allowed to breathe back out. Sunbrella is one of the most fade resistant materials available on the market. We back it with a 10 year warranty. No other marine fabric on earth withstands the ravages of water, sun, salt or wind better than Sunbrella®.